(Guest) J&C Studios O Gauge Archive Photo Poll: Jan. 2012 Ready for winter on the line! Topic: Ready for winter on the line! B&O snow flanger 43 was built from an M-8 class box car of 1898 in the 1930s. It was burned by vandals at M&K Junction in West Virginia in 1996, just 2 years short of its 100th year and before it could be moved to the B&O Museum in Baltimore for preservation. Snow flangers were pushed ahead of a locomotive to clear snow and ice slightly below the railhead. An operator used air pressure to raise and lower the plow in order to clear switches and grade crossings. A steam line from the pushing locomotive was used to keep the flanger mechanism from freezing up. 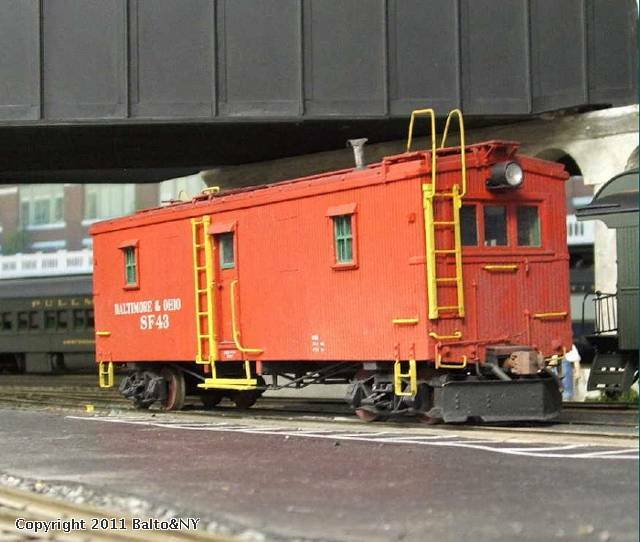 The model was re-built from a kit built 1950 Train Craft tool box car in 1995. B&O diagrams and plans were used for the body modifications and scratch-built brass plow. The model has a working headlight, brake details and a detailed interior. Another great model of yours! I enjoy seeing your posted work. Is it still at the B&O Museum? Sadly, the SF 43 snow flanger never got to the B&O Museum. It was burned by vandals in 1996 before it could be stablized enough for loading its body on a flat car for the trip. It was the last of several similar snow flangers the B&O used. The model shows how it looked in the 1950s.